Invoking their favorite metaphor (shoe on other foot), this morning's Intelligencer editorial argues that the Obama administration along with Democrats, are guilty of a war on women. 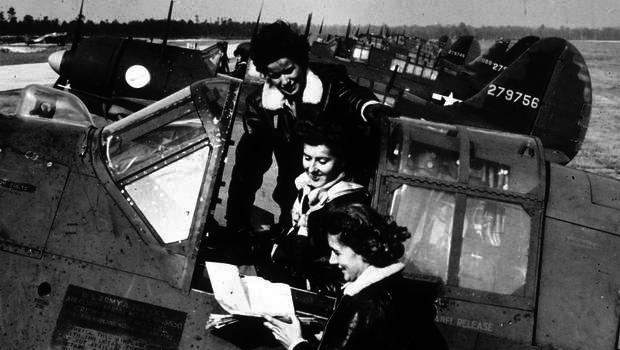 The editorial about honoring the women who were pilots during World War II draws its conclusions without any evidence. In this case the original story which justifies the editorial is not that well-known and was not previously covered by the Intelligencer. This is a fairly common practice for them because it allows the editorial writer to pick and choose whatever is needed (or not needed) to support the editorial's premise and the reader will most likely not be aware of evidence to the contrary. Members of the Women Airforce Service Pilots group who flew noncombat missions for the military during World War II deserve to be viewed as veterans. A 1977 federal law codified that. In 2002, under then-President George W. Bush, the decision was made to allow any ex-WASPs who desired to be interred in Arlington National Cemetery. (L)ast year, President Barack Obama's administration did something distinctly biased against women: Then Secretary of the Army John McHugh declared there would be no more WASPs buried at Arlington. But in 2015, then-Army secretary John McHugh revoked that right after lawyers determined that WASP program veterans did not meet the Army’s strict eligibility rules for inurnment at the Arlington cemetery, which the Army oversees. Although the service of these women was highly commendable and deserved recognition, the cemetery said in a statement earlier this year, it did not "reach the level of Active Duty service required" to be inurned at Arlington, where there is limited space. It took an act of Congress, controlled by Republicans, to reverse the policy. Sen. Barbara Mikulski (D-Md.) also worked to overturn this decision. She introduced legislation early this year that sought to give WWII women pilots the option of being inurned at Arlington. The legislation passed both the US House and US Senate unanimously, as the Monitor has reported. Last week, Obama signed into law a bill allowing ex-WASPs to be interred at Arlington. No doubt the "optics" - the public relations appearance - of vetoing it was a consideration. Obama could have rescinded McHugh's policy by issuing an executive order of the kind he is so fond of using. He chose not to do that. Can this editorial be any more hypocritical? A month seldom passes without an editorial or Myer column that tells us how illegal it is for our "imperial" president to issue executive orders but now it's what he should have done? In this case, it took the GOP Congress to do the right thing for a group of patriotic, often courageous, women the liberals slighted. -- criticizes the president for not taking the type of actions that it has previously attacked him for taking. The Intelligencer and News-Register have committed these ethical sins previously but no editorial has previously done them so often in so few words. (Only 223 words.) I can say without any doubts that this is the most unethical editorial that I have read in the 27 months that I have been doing this blog. And for those of you who are new to The Wheeling Alternative, this is one of the reasons why I refer to the Wheeling Intelligencer and the Wheeling News-Register as "newspapers."